Why herd shares and what are they? It works like this: We do all the hard work – milking, grazing, doctoring, delivering etc. We do all this for a boarding fee of just $33.50 a month, per share + flat delivery fee. It’s that simple. Your boarding fee will be dictated by the amount of milk you wish to receive each week. The lowest amount you can get is a half gallon per week. Our example information assumes a one gallon per week amount. Start up costs include your herd purchase, jars, first months boarding fee and delivery. After that you settle into the routine Boarding Fee and delivery due at the beginning of each month. To get started just contact us by e-mail, or give us a call (804-931-8197). Simply let us know how many shares you’d like, which drop site works best for you (currently 16 to choose from), and when you’d like to begin receiving milk. Once we have your initial payment and signed paperwork we’ll get the deliveries coming! Please understand – you are not an active Herd Share Holder until we receive your completed paperwork and initial payment. We will confirm with you by email, phone or in person when all required aspects are in order. No deliveries can or will be made until all legal and financial aspects are in place. We handle deliveries through our drop site system. These are our current drop site locations as of 7/28/18. The times listed are the time you can pick up by, or any time there after. There is no need to meet us there. Note: “private residence” simply means the pick up location is at a private home. You can pick up here, but we do not publicize the private addresses on the web. This will be provided to you if you join the program and elect that as your pickup location. Natural pHuel – (Farmville) – Monday @ 11:30 am. Amelia – (Elim Springs Farm) – Monday @ 12:00 pm. Heretick Feed & Seed – (Hopewell) – Monday @ 12:30 pm. Rx3 Compounding Pharmacy – (Chester) – Monday @ 1:00 pm. Quintessential Chiropractic – (South Chesterfield) – Monday @ 2:00 pm. Powhatan (private residence) – Tuesday @ 12:00 pm. Good Health Herbs – (Brandermill area) – Tuesday @ 12:30 pm. Treasures of Health – (Mechanicsville) – Tuesday @ 2:00 pm. Sandston (private residence) – Tuesday @ 2:30 pm. The Olive Oil Taproom – (Bellgrade) – Thursday @ 1:30 pm. Richmond (private residence) – (Bryan Park area) – Thursday @ 1:30 pm. Collegiate – (private residence) – Thursday @ 1:30 pm. Petite Pet Inn – (Lakeside) – Thursday @ 2:00 pm. The Herb Closet – (North Chesterfield) – Thursday @ 2:30 pm. Good Health Herbs – (Brandermill area) – Friday @ 12:30 pm. Churchwood (private residence) – (Short Pump area) – Friday @ 1:00 pm. Glen Allen – (Harmony Hill Farm Store) – Friday @ 1:30 pm. Rx3 Compounding Pharmacy – (Chester) – Friday @ 2:00 pm. Magnolia Green (private residence) – Friday @ 2:30 pm. 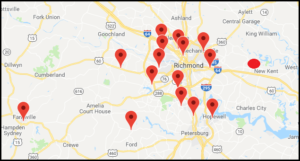 ** – It is illegal for anyone to sell raw milk in the Commonwealth of Virginia. Each state makes up its own guidelines and the Commonwealth of Virginia has chosen to follow the FDA regulations regarding the sale of raw milk and raw milk products. A Share Program is legal in the Commonwealth of Virginia, there are no regulations regarding the consumption of raw milk from an animal that the individual owns or owns a stake in. http://www.westonaprice.org/ and http://www.realmilk.com/ are two websites with valuable information about the benefits of drinking raw milk.